Announcement FREE SHIPPING on all orders through December 15th + all orders over $25 get a FREE personalized ornament! All items seen below are completely customizable! FREE SHIPPING on all orders through December 15th + all orders over $25 get a FREE personalized ornament! 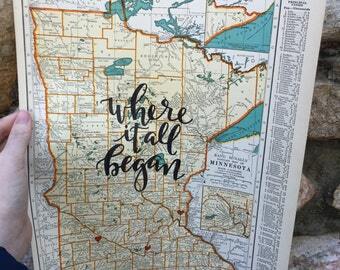 Abby's maps are done beautifully, and make wonderful gifts! I ordered 4 as Christmas gifts for girlfriends, and they all loved them! Thank you!! Every piece created by Truly Yours Design Co is a completely customized creation! We have a large selection of curated vintage maps to look through (and even more that haven't been listed). Each map is then customized with a modern calligraphy quote of your choosing by owner, Abby. Reclaimed wood slices with catchy phrases and floral work are also up for grabs- each one painted by hand with love! Abby began creating calligraphy pieces for her own wedding back in July 2013. Little did we know then, it would turn into an artful adventure for the years to come! What started out as making all of the decor for our summer wedding, turned into Truly Yours Design Co. I love what I do and make sure to let that show in each piece I create!